Lime Firms Ltd runs courses both at Bridgend College and also at the National Trust's property at Llanerchaeron, near Aberaeron. The Introduction to Lime course, recently held at the National Trust property, dealt with not only lime mortars and their application in the heritage sector, but also the use of lime as a binder in new-build work. 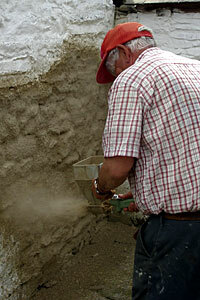 The crucial importance of careful aggregate selection, correct mixing and application techniques are just some of the subject areas covered. In addition, consideration is given to some of the novel lime-based construction techniques such as hemp and lime insulating plasters, hemp concrete and lightweight lime concrete. Bouyer Leroux BGV bricks were used for the structural masonry element on this recently completed private recording studio. The bricks were specified by the award-winning architects WCEC Architecture because of their excellent environmental credentials in addition to their valuable acoustic characteristics. The blocks were faced externally with a natural stone veneer to enable the building to harmonise with local vernacular building styles. Consulting Engineers on the project were McCarey Simmonds. Lime Firms provided materials, comprehensive product support and training in conjunction with the manufacturer, to enable the fast build-rates possible with BGV bricks to be achieved.